Mix together the Yorkshire Wensleydale & Ginger cheese and cream cheese, add enough cream to make a stiff consistency. Add the stem ginger and then the icing sugar to taste. I sampled the Wensleydale and Cranberry cheese recently – a lovely flavour and lingering aftertaste that took me back many years, reminding me of a superb traditional Polish cheesecake I used to buy from a deli. in Chiswick, London. Your recipe with ginger is on my ‘to do’ list, as is cheese and apple cake with cranberries. Many of my childhood holidays were spent in a tiny cottage at Crow Corner in Middleham, near Leyburn and memories of home-cured bacon, eggs laid that morning, mushrooms fresh from the field and veg. from the garden, have come flooding back. MMmmmm…. Hi, we would recommend reducing the recipe and making a smaller cheesecake, rather than freezing. Many thanks. I am going to make this for friends visiting. Can you tell me if you crumble, grate ? Wensleydale cheese to add to cream cheese. Just don’t want to end up with lumps in the cheesecake mix. Thank you. Hi, we crumble it in our recipe. If you are concerned about lumps you may wish to crumble and then “mash” with a fork to break the pieces down even more. Hope that helps! Thank you. 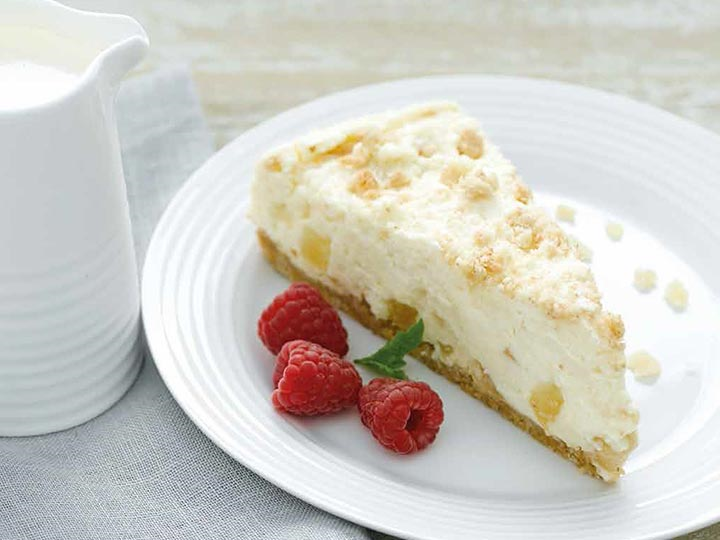 Making this cheesecake this morning now! Not being a ginger fan, I’ve made this recipe several times with different varieties of your cheese! I’ve just done an Orange and Champagne Wensleydale one for Christmas, and in the summer I did a Limoncello and a Blueberry Wensleydale, all delicious! I wonder if you could do the same in your restaurant? I would love to have cheesecake for a treat when we visit but it’s always ginger! This is the most amazing cheesecake! You have no idea how happy I am to see this recipe!! I love, love, love this recipe. Thanks for inventing it! I made this but used equal weights of digestive biscuits and ginger nut biscuits. it was very more-ish! I am sat in the Wensleydale Creamery, in the sunshine, eating Wensleydale and ginger cheesecake. It is absolutely yummy and I can’t wait to make my own. Thank you so much for the recipe!